The CNIB Foundation Ontario East is a non-profit organization driven to change what it is to be blind today. We deliver innovative programs and powerful advocacy that empower people affected by blindness to live their dreams while tearing down barriers to inclusion. Our work as a blind foundation is powered by a network of volunteers, donors and partners in communities across Ontario East. Geographic region of focus: Eastern Ontario: Belleville, Cornwall, Kingston, Ottawa, Peterborough and surrounding areas. Fundraising priorities: The CNIB Foundation Ontario East Community Hub is the key funding priority. Capital needs and renovations include: an accessible kitchen, guide dog bar, creativity corner, flexible workspace and Regional Centre of Excellence for Accessible Technology. Another funding priority is CNIB Guide Dogs, a new program to raise and train guide dogs exclusively for people with sight loss. Donate a smartphone. Change the life of someone who is blind. Many people don’t realize the tremendous impact smartphones have on the lives of individuals who are blind. Smartphones allow someone with sight loss to read prescription labels and take medication safely, recognize the faces of loved ones, access emergency assistance from sighted volunteers, travel safely alone using GPS and do hundreds of other day-to-day tasks most of us take for granted. For some people, it’s hard enough to make ends meet. That’s why we need you. 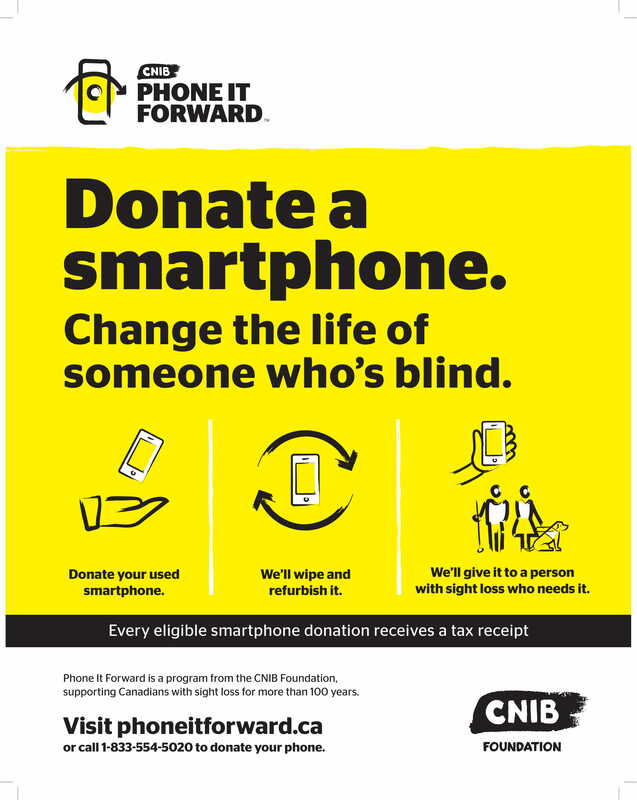 Visit phoneitforward.ca to change a life. Active at every level of our organization, volunteers are key agents in moving CNIB’s mission forward. From exciting community programs to national initiatives and leadership roles, there are so many ways to help change what it is to be blind. Volunteers can support the Phone It Forward program as one-on-one tech trainers, for which we will provide training. They can also promote the program to their networks. While the calendar varies from year to year, CNIB Night Steps, a walk under the stars, and Dining in the Dark, a blindfolded dining experience, are popular events. Plus, we’ll be hosting a wide range of fundraising activities at the CNIB Foundation Ontario East Community Hub in Ottawa. We often have fundraising teams in Ottawa, soliciting monthly donors. The canvassers sporting CNIB vests are positioned at main intersections. Funds raised will support CNIB’s tech programs. Our programs give participants the tools they need to unleash the power of technology through hands-on training and one-on-one support. CNIB’s Second Century of Change campaign is celebrating 100 years of helping community members with sight loss build the necessary skills to lead independent lives. The goal for this campaign is $100 million.